But you stress at reading a wine list, right? And it sounds like a different language when people talk about wine, doesn't it? That's how wine columnist Len Napolitano felt when he was a self-conscious wine amateur until he cut through a web of peculiar wine terms and complex subjects and transitioned into a practical wine professional. 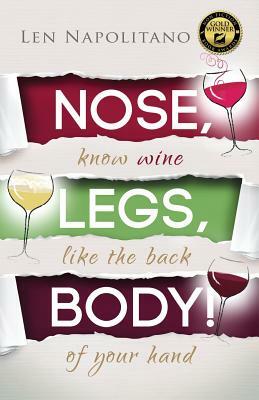 Now, in this informative and entertaining new book, Nose, Legs, Body Know Wine Like The Back of Your Hand, Napolitano takes you from wine beginner to wine savvy. He fits a bounty of useful information into 50 concise answers to common, yet critical, wine questions and concludes each chapter with enlightening, hands-on wine tasting exercises to do at home. As you begin to understand wine and appreciate its potential to complement so much in life, you open new possibilities for joyful experiences in socializing, dining, and everyday living. So, let the wine education begin From learning the basics of wine to discovering the how's and why's of a great wine, your confidence will grow when talking about wine and choosing it in any situation. Len Napolitano, "wineologist" from 2003 to 2010 on TV's Fine Living Network (now Cooking Channel), guides you in your first steps in wine-essential steps to exploring, learning, and tasting. With sincerity and whimsy, Len examines a broad range of wine subjects as you gain a new and practical knowledge of wine. Chapters are organized according to meaningful subjects wine lovers want to know, explained in an informal, question-and-answer format. Nose, Legs, Body is perfect for social wine drinkers, businesspeople who entertain wine-savvy clients, cooking hobbyists, food service professionals and anyone transitioning from a beer or martini as his or her beverage of choice to a crisp pinot grigio or robust cabernet sauvignon. 1. How does wine get so many flavors and aromas? 2. How does wine get color? 3. What makes chardonnay, or any wine, taste different among producers? 4. Why are some wines blended? 5. Why are some wines filtered? 6. Why is wine aged in oak? 7. What is a wine appellation of origin? 8. What is a vineyard-designated wine? 10. What is the relationship between wine and weather? 11. What is hang time? 12. What can be learned from a visit to a winery? 13. What's happening at a winery during harvest? 14. Do sulfites in wine give me a headache? 15. What is organic wine? 17. Why do some dry wines taste sweet? 18. What is a "hot" wine? 19. What should I look for on a wine label? 20. What's better-cork or screw cap? ...Plus 30 more, with quick-reference tables & glossary.